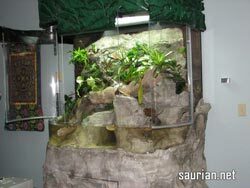 In the summer of 06 I was approached by an individual in the St. Louis area that wanted a very nice terrarium for his office. 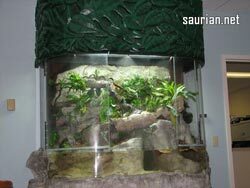 We discussed what he wanted, and we came up with some general ideas, such as a bow front terrarium with front opening doors, and a large water feature in the bottom of the tank. 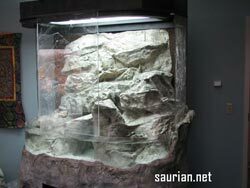 As I began planning the tank, I also met an artist here in the St. Louis area, (Tim Longmore, Poly Art Studios) who has done exhibits for some institutions and is an expert at working with foams, plastics and other manmade materials, and making them look 100% natural. I decided that he could do a lot better job on the tank than I could, and turned over the fabrication of the basic tank, stand and canopy to him. The result can be seen in the photos below. The tank has only been up and running for a few days, but so far it's a great success, and I believe it will only get more beautiful with time. The tank is about five feet long, about 30 inches from front to back, and the viewing area is about four feet high. The overall tank is about eight foot high. It is lit by four 96 watt compact fluorescent bulbs. 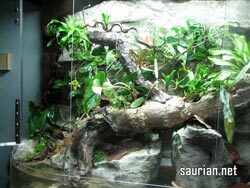 There is a sump below, which houses the pump for the water features, as well as the Rainmaker misting system pump. The misting system cycles on and off about twenty times during the day, for about 15 minutes per cycle. The water feature area currently only has a few fish, but contains about 60 gallons of usable water space, and will eventually house 30 or 40 small tropical fish. If you are interested in such a custom tank, please contact me. Large custom built tanks such as this one run about $10,000.00 or more, and can be shipped anywhere in the country. In the near future a collaboration between my self and Tim at Poly Art Studios will result in smaller tanks that look similar to this one, but in the acrylic cube tanks we are of fer ing here on the site. I expect to roll out our first design around late March! Pricing will be slightly higher than I am charging for my custom made water features, probably around $300 for this feature.